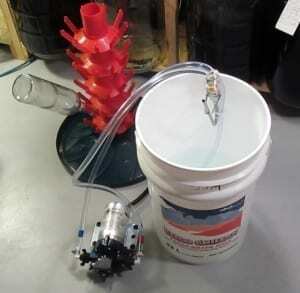 This bottle washer/sanitizer comes ready to be attached to a bucket. The bucket and the optional filter are not included. It has 45 PSI and 3.3 gallons of flow per minute. You may be asking yourself – what does that mean for me? You can clean your bottles using any sanitizing solution you prefer. It takes literally seconds to sanitize a bottle – completely! It has a screen on the input end of the intake hose in order to protect the pump from any debris that may be in the sanitizing solution. This system is entirely portable and can all go back into the bucket for storage purposes. This is an on – demand pump and you will get years of service out of it. It is self priming up to 9 feet vertical. Do not exceed 130 Fahrenheit liquid temperatures. It can also be used as a transfer pump for potable water or transferring large amounts of wine.